A puzzling lifestyle with plenty of action. ← Offense, defense, and hurting your opponents? If you could pick just five techniques to practice, what would they be? Good question! I’m going to assume that you mean “attacking pattern” by “technique” and that we can keep the full range of our dodging, footwork, etc. I can only really think of four, to be honest: palm strike, hip throw, gripping, and organ-seeking kick. For fun, I’ll also include their “kung fu name” as I know them from Baguazhang. 1) Palm strike: Open Window to Look at Moon. 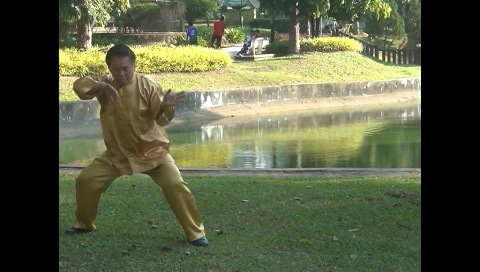 This is the first and one of the most common attacking patterns in the Swimming Dragon 64 Palms set of Baguazhang. It’s a very safe strike to use, with the stance and guard-hand keeping the exponent well covered. 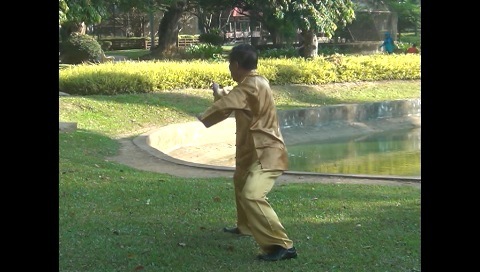 The distance and spacing conveyed by the length of the stance and arms also make it easier to use Baguazhang’s famous skill of getting to an opponent’s side or back. 2) Hip throw: Black Bear Fells Tree. Felling techniques have always been a favorite of mine. Any good felling technique requires a solid stance and a strong & limber waist. The first few generations of Baguazhang masters, having been professional bodyguards, would never use “sacrifice throws” like are often seen in Judo, wrestling, and other grappling arts today. Black Bear Fells Tree, like Open Window to Look at Moon, appears in the first sequence of the Swimming Dragon set. 3) Gripping: Leisurely Grab Goat. Though Baguazhang is not very well known for gripping (qin-na) techniques, some Baguazhang classics like the famous Study of Baguazhang by the martial scholar Sun Lu Tang mention that the “Seventy-Two Shaolin Qin-na Techniques” are present, though often hidden. Leisurely Grab Goat is a more obvious gripping technique that appears in several sequences of the Swimming Dragon set. 4) Organ-seeking kick: Phoenix Robs Nest. The No Shadow Kick has always been my favorite genre of kicking technique, and the organ-seeking kick is my favorite kick to use when implementing that technique. This pattern also appears in the first sequence of the Swimming Dragon set. These techniques (well, more importantly, the skills behind them, like timing, spacing, proper stances, and good footwork) have seen me through every sparring situation I’ve been in. I’m lucky enough to never have gotten into a “real” scrape before, so I can’t really comment there; I’d probably invoke “run the heck away” in a bad situation! 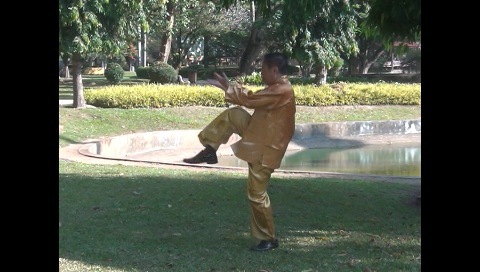 In kung fu, all attacks are generalized along the four categories of “striking” (anything involving the arm, such as the hand, elbow, forearm, fingers, or shoulder), “kicking”, “gripping”, and “felling/throwing” (grappling, wrestling, and groundwork are somewhat distributed between gripping and felling). I figure that having one very well polished technique from each category should do me well. 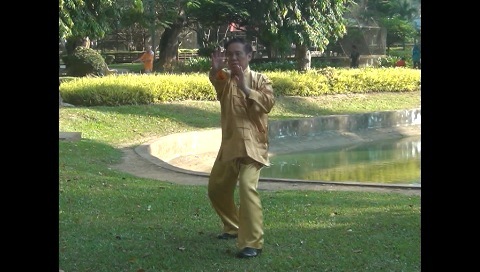 Funnily enough, many kung fu masters were known for just using one or two techniques as their “ultimate” technique to defeat all opponents. A few that I can name off the top of my head are: Yang Lu Chan (Cloud Hands), Hoong Hei Khoon (Tiger Claws and No Shadow Kicks), Dong Hai Chuan (Single and Double Palm Change), Cheng Ting Hua (Single Pounding Palm), Guo Yun Shen (Half-Step Crushing Fist), and the Venerable Chee Seen (One Finger Zen and Iron Head). Some lesser known masters could be people like Li Siu Wan (Through-the-heart Kick) and Kuru Chang (Through-the-heart Iron Palm). How about you folks? Got a few particularly favorite patterns or stories about them? Feel free to share in the comments! I've a healthy fascination with unhealthy things. I am presently a resident physician emergency medicine in Florida and particularly enjoy orthopedic injuries, trauma, and prehospital medicine. In my non-academic time, I enjoy practicing kung fu (especially Wahnam Baguazhang), and I am a big fan of cooking and parkour. Cheers!